Do I have a cold or the flu? That’s a question medical professionals hear frequently because symptoms are so similar. Most cases of the flu are mild and will resolve on their own in two weeks or less. A seasonal flu shot is the most effective way to prevent the flu. Everyone older than 6 months should receive a flu shot every year. If you need one, visit The Emergency Center nearest you. Patients who come to The Emergency Center with concerning flu symptoms will receive a prompt assessment by one of our board-certified emergency medical physicians. If your symptoms are serious, you will be stabilized and our providers will closely monitor your health for up to 23 hours. All three locations feature diagnostic imaging, an on-site pharmacy where we can provide up to three days worth of prescriptions, on-site labs, and imaging. The Emergency Center prescribes Tamiflu and Xofluza for patients with the flu. 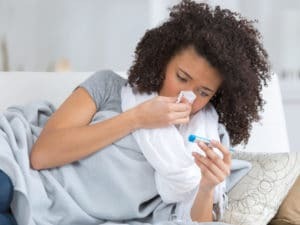 Flu complications can range from mild—sinus and ear infections—to severe—pneumonia, cardiac inflammation, sepsis, and organ failure. Because the flu can lead to life-threatening complications, it is imperative for people in high-risk groups to seek emergency care when flu symptoms become serious. If your condition is mild enough be treated at an urgent care, we’ll help you find one or offer an affordable self-pay rate for any services you may need. We offer transparent pricing and never send surprise bills.